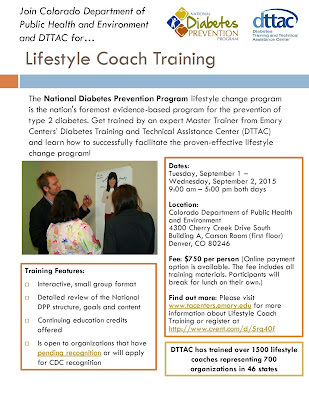 The Diabetes Training and Technical Assistance Center (DTTAC) at Emory University is hosting a Lifestyle Coach Training for the National Diabetes Prevention Program (DPP) in Denver, Colorado September 1-2, 2015. Free visitor parking is available onsite. Fee: $750 per person (online payment available). Participants will break for lunch on their own.